The pictures below are anchors that can be clicked to display the larger version. There are some links at the end of this report. In late 2008 a friend offered me an old lathe on the condition that I also took the bench. 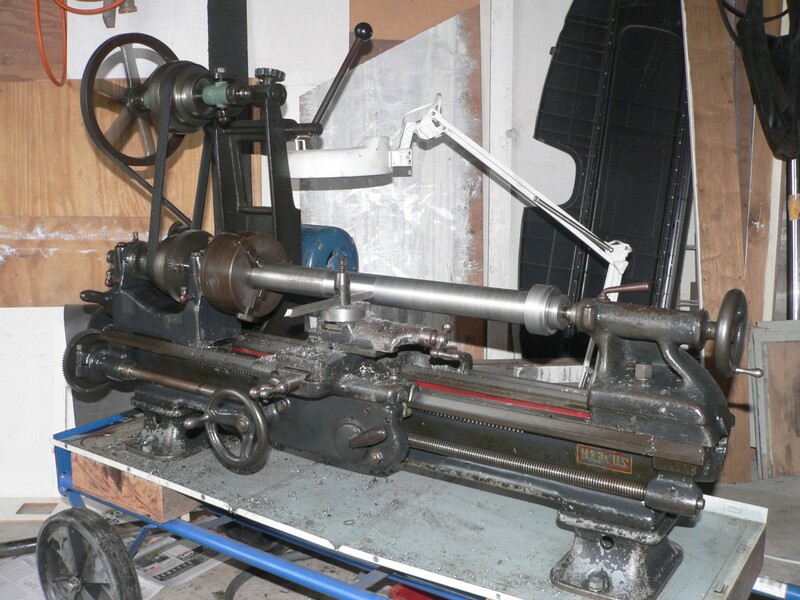 The lathe was a Hercus 9" Model VBC manufactured in 1946. I eagerly took the lathe and bench and slowly pulled it apart and bought some replacement parts. By mid-2009 other things had taken priority so work on the lathe stopped. In May 2010 someone asked me how it was going and I had to admit I hadn't done anything in ages. I decided I had to get it going. Shortly afterwards the lathe cut its first piece of metal in about ten years and I spent a week testing it. This was better than expected. It's a clunky old thing but certainly nice and solid. I'm comparing the Hercus to my Chinese lathe which is a capable workhorse but rough and soft in some areas. The Hercus just drips quality (and oil) and the attention to detail is excellent. The bed and spindle are in good condition and I've replaced the feed nuts for the slides. The carriage and slides move smoothly. The lack of belt guards is a bit iffy and if I were more cautious I'd probably worry about it. Best to keep clear and not have loose clothing. The extra speeds provided by the backgears are a welcome feature. One initial problem was that the flat belt didn't track well and loved falling off the pulleys. I adjusted the claws to get the countershaft parallel with the spindle and tried various pulley alignments but nothing solved the problem. A last attempt was to reshape the countershaft pulley with a file. This covered the lathe with cast iron dust. What a disaster! Rather than clean it and hope it was okay I decided to pull it apart again, clean everything properly, and re-assemble it. The pictures here illustrate the three day rebuild. The countershaft bearings seem a weak point so I've made some changes and detailed these here. The flat belt and 3-speed pulleys have been replaced. See here for details. I've made a parting blade holder that can be easily installed in the top slide. See here for details. 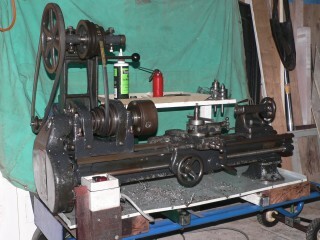 The lathe now has its upgraded countershaft bearings and V-belt pulleys. I've fitted all the gear covers to make it look respectable. The toolpost has a spacer ring so I can fit my 3/8" square tool with no holder. I bought a cheap Chinese live centre and tailstock chuck. These are junk so I've now bought better quality Chinese replacements from Hare & Forbes. Who says I'm not a helpful participant in the Australian economy. A carriage stop and/or a scale to measure carriage movement accurately sounds like a good idea to me. Being a modern geeky kind of guy, I've installed a digital caliper. The holder was more work than first anticipated. It's a great extra now it's finished. There are people who can provide information and some parts. The Hercus forum is a good source of relevant posts and access to some very knowledgeable people especially Bitza500. Mick Moyles Engineers Supplies is a great shop with lots of useful bits. English page with an illustrated history of Hercus lathes. Mal's online shop has Hercus parts listed. Wow, more supplies in Sydney. F&D O'Conner Pty Ltd sounds like a good source for flat belts. PIES Australia Pty Ltd sounds like a good source for toothed belts and pulleys. There is a PDF version of "Hercus TextBook of Turning" on the Internet. Also there is a PDF called "sbarmylathe.pdf" around. This is a manual for the South Bend lathes that are very similar to the Hercus lathe. 2013-07-08: Spindle points slightly downwards (about 1 in 1800) so I put brass shims under the front of the headstock. The shim over the Vee at the back of the bed should be about 50% thicker than the shim at the front of the bed. I ended up having a .001" shim at the front and a .002" shim at the back. The spindle now points up at about 1 in 7000. This change meant the tailstock height would now be wrong. Actually, the tailstock was already too low and I ended up using .005" shims to match the spindle height.